Have a question about our products, or want to collaborate on your project? Come join us at SmallSat 2019! We will be located in the field house, booth space 215 with information on our latest 32% efficient solar cell offering, XTE. For additional information on XTE, we will also be hosting a side meeting titled Spectrolab is Building Tomorrow’s Space Solar Cell Today with 32% Efficient XTE to answer questions about our best in class efficient solar cell offerings. Meeting time will be from 9:30AM to 10:30AM. We will be at Space Symposium 2019 to provide XTE product overviews to the satellite community. If you are interested in seeing us at the event, please contact us through this website. Come see us at Space Power Workshop! We will be presenting our data on the qualification of our 32% efficient XTE solar cell, flexible arrays, and advanced testing technology. Join us at 2019 HAI HELI-EXPO in Atlanta, GA : Show March 4 - 7, 2019, Exhibit March 5 - 7, 2019. Helitech International brings together the global rotorcraft community and delivers solutions to inspire new ways of providing civil and para public services to market sectors. The exhibition and conference offer exclusive knowledge-sharing platforms and valuable networking opportunities to develop new and existing business partnerships across the globe. The growth of small satellites has been fueled by the promise of shorter development cycles, lower cost, new technology, and more frequent access to space. As on-orbit results pave the way, small satellites are increasingly being considered for critical, high-value missions. These are taking the form of emerging applications with highly constrained payload requirements, new system architectures that seek operational resiliency, and numerous other user-driven conditions for availability. With affordability and responsive timelines being a classic imperative for small satellite missions, appropriate technical and programmatic approaches must match these expectations. Developers are now seeking innovative ways to increase the odds of mission success by employing diverse design techniques, autonomy methods, and streamlined processes that help identify and mitigate potential issues. However, a balance must be found between lessons learned and new concepts that achieve mission success. During the 32nd AIAA/USU Conference on Small Satellites, we will explore the new technologies, design methods, processes, operational constructs, and activities that inform and secure the success of small satellite missions. Join us at APSCON 2018 in Louisville, KY : July 9 - 14, 2018! 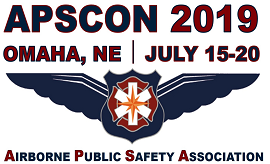 APSCON 2018 sets the standard for excellence in the field of public safety aviation. Filled with education and training, APSA will again offer some of the best conference courses and classes in our industry, presented by the experts from our industry.